For nearly ten years now, the Super Monkey Ball series has graced many different platforms with it’s simple, balance driven gameplay and made AiAi and his monkey crew a household name in the gaming world. Launching with the Nintendo 3DS, Super Monkey Ball 3D looks to not only put the core gameplay elements to use with the 3DS’ gyroscope control scheme, but also broaden the series with two other modes that should be a bit familiar to any Nintendo fan out there. So how do AiAi & company roll in this new 3D realm? Here is my review for Super Monkey Ball 3D. Start up this Monkey Ball adventure and you are taken to a rather simplistic screen with three modes. While we have seen many titles in the series with more activities in the past, these three are a bit more meatier as a whole and certainly host some entertainment, but one certainly outweighs the other two by miles. After spending quite a bit of time with all three modes in Monkey Ball 3D, I can easily say that there is no beating out the classic formula of Super Monkey Ball. If you are new to the series, the main objective is to simply roll your monkey through a maze-like stage while avoiding various obstacles to make it to the finish line in a set number of time. There are four different and very familiar monkeys to choose from, but they possess the same feel mostly so your monkey of choice really comes down to favoritism or personal preference. 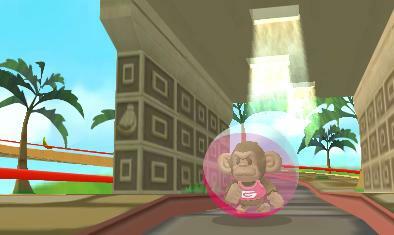 Super Monkey Ball 3D also now boasts two different control schemes, each playing dramatically different from the other. The first method of control is to use the circle pad to guide your monkey around the maze as you tilt the land back and forth. While this method is extremely precise, it also suffers a bit due to lack of challenge. 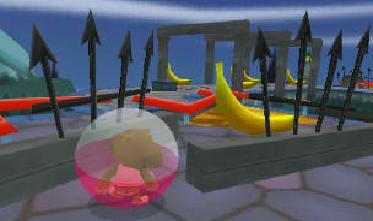 The main objective is to simply hit each finish line and unless you are dying to reach every single banana or collectible, breezing through the 80 stages comes with not much of a problem due to railing which blocks you from falling off in many areas and obstacles that provide more of a minor pit-stop or slow down than a true challenge. I finished the entire game in a small sitdown that lasted around two hours with this control method, and while yes, it is still fun to actually play, the lack of a true challenge prevents it from reaching it’s full potential. While I didn’t really get into the circle-pad scheme of things, the gyroscope motion control method actually was a much more rewarding experience. This method allows for players to roll through the same stages, but instead of using the circle pad to control your stage, players get to tilt their system in different directions to guide their monkey to each finish. Since you are actually moving the system constantly, it is almost a requirement to turn off the 3D or else the visuals become a bit blurred and harder to actually see but the level design does not really call for 3D to be on to start with, so flipping the switch should cause no problem whatsoever. I played through the game first with the circle pad, but the gyro method actually made each level feel brand new with more of a challenge as the game now added strategy to each maze. Now when you run up ramps, you simply don’t just move your ball up a ramp, you must precisely tilt back your system and move it forward quickly to gain a bit of speed. With everything controlling rather smoothly, this certainly made each level much more enjoyable overall. The environments in the levels look amazing and feel alive with each world having it’s own theme players must roll through. What holds the game back though is that the themes are not fully utilized to their full potential in gameplay. Take the Banana Nightmare levels for example, where you have stage after stage that is full of life with ghosts wandering about and a world that looks straight out of an animated feature. Instead of having any interaction with this environment, sand of all things is about the only obstacle that blocks your path. Some stages do offer a bit more themed interaction rather that just standard background scenery, but moments like the one I mentioned made me hit the finish line feeling a bit cheated. As a whole though, the Monkey Ball mode is by far the best in the game and is a lot of fun to go through, even if it mainly to see the impressive sights and tackle the innovative use of the gyroscope controls. I really wanted to enjoy Monkey Race more than any other mode as I really enjoyed Sonic & Sega All-Stars Racing which released last year and was hoping for a similar experience. This mode however is a lot more like Mario Kart and plays rather similar, with modes such as Grand Prix, Time Trial, and standard singles races. 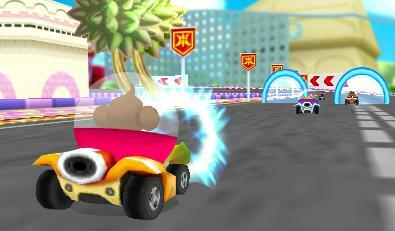 You simply race against seven other racers to the finish in a set number of tracks, using power-ups along the way. Of course not everything is reminiscent of Mario Kart though as many of the power-ups feel off balanced an lead to quick stops to the action that can completely take you out of the experience. Some power-ups however are clever such as a dizzying disco ball and help balance out the more over-the-top ones which definitely keeps things a bit more enjoyable overall. After you unlock the 16 different racers in the game, there are many different vehicles to choose from which does make this feel much bigger than it’s add on feel. Controls are done rather well and as I mentioned, if you have played just about any Kart Racer, you should feel at home as the feel is nearly the same, even if this racer is not quite as polished. Much like Monkey Race feels like a smaller version of Mario Kart, Monkey Fight feels like a smaller version of Super Smash Bros.. Now of course it isn’t a bad thing to copy from such a fantastic series so that is certainly what this fighter does right as it feels nearly the same in many areas. 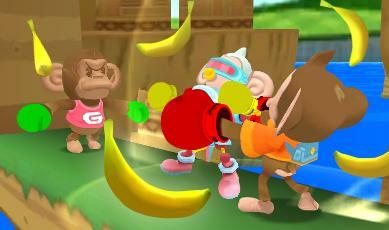 The main objective for most the variants of fights usually has you beat the bananas out of other monkeys, quite literally actually. The monkey with the most bananas when the time runs out is the victor. Power-ups can also be acquired through golden barrels and each character offers up a different move to tip the advantage to their side. The only problem with this mode is that each monkey feel and play the same, with the main attack being a generic melee so there really isn’t a whole lot of strategy behind this and as a result, things can get a bit stale just a few rounds in. For all of these modes that practically scream for multiplayer options, local wireless is the most that is offered throughout the game. I really felt like online mode would have added a bit more replay value in the long-run, even if it were just a simple leaderboard. Local wireless is something though and if you have a friend with a 3DS, Monkey Fight & Racing are much more enjoyable over just competing against the standard AI. 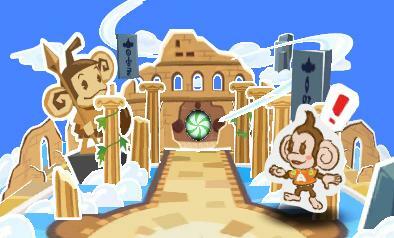 While the 3D in Super Monkey Ball 3D doesn’t truly do much for the actual gameplay, it is still really nice to look at. 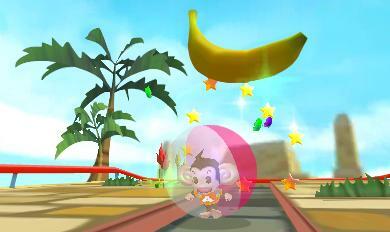 In the standard monkey ball stages, everything pops out of the screen and animations send things like bubbles and ghosts right out of the screen. The graphics in general are still worth the price of admission as well as every location is bursting with color and life, but this also makes it a shame that more interaction wasn’t included that would have added a lot more depth to the overall experience. The racing does indeed look great in 3D, but I felt for Monkey Fight it was nearly unnecessary as the camera angle used just does not fare well to see someone like AiAi punching GonGon from what appears to be a mile away to begin with. Menus and the small interlude scenes give off a Paper Mario effect which to myself were the most charming sequences in the game. Another redeeming factor for this title lies in the soundtrack. Each theme perfectly fits with the level you may be rolling through and adds a lot of atmosphere which helps bring the stunning scenery to life. I mentioned the Banana Nightmare stage for good reason earlier, as the level looks amazing to start with, but the score used to go along with it has to be one of my top tunes for a game this year as it truly sets the mood for the theme of the stage and much of the other music in the game completes that task successfully as well. The monkeys all have their own sounds and voices which add a nice feeling of character and also keeps everything feeling like a Monkey Ball title, no matter what mode you may be playing. For a game with such great presentation value, Super Monkey Ball 3D comes up a bit short in other areas. While the main game is a short, yet fun filled adventure while using the gyroscope controls, Monkey Race & Monkey Fight feel simply like last minute add-ons to stretch the life of the game out. That doesn’t quite mean they are bad by any means as I enjoyed each for what they were, but the gameplay just felt a bit uninspired and rushed for each mode. To sum that up best, it is kind of like you are purchasing one full game with two bonus add-ons. Some may love having the extra two titles, but I was just a bit saddened to see this extra content not reach it’s full potential. 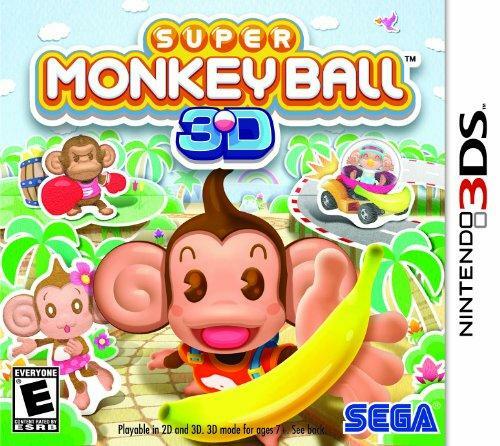 Either way though, Super Monkey Ball 3D is definitely offers quite a bit of fun and variety for any fan of the series and still manages to keep the same Monkey Ball charm that has kept the franchise rolling along for the past decade.